I probably should have done it before I went to Hannibal Rocks :-) Better late than never – the winch is finally on. I went with an Atlas 9500lbs winch which being quite inexpensive still has some nice features like series would motor or wireless remote. 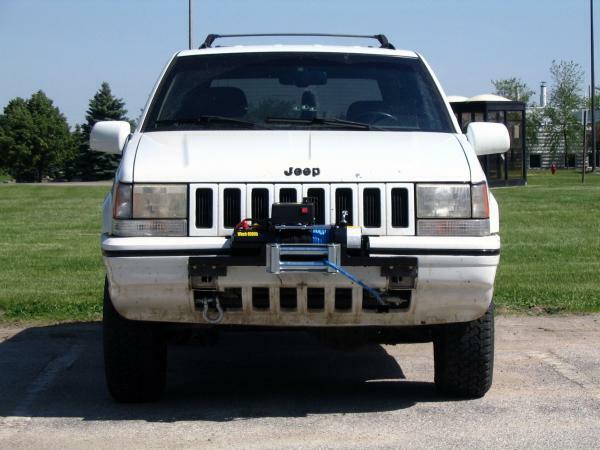 The whole idea was to mount the winch securely and yet keep as much of stock bumper I could. I had some problems how to accommodate universal mounting plate. I even considered getting rid of it and fabricating something else in it’s place. But finally I did it and it doesn’t look that bad. I also gained nice mounting point for fog/driving lights! On Saturday I did my first serious off-road. I went to Hannibal Rocks off-road park to test my new 3″ lift I put on earlier last week. Results? I am very disappointed. I mean the lift, the whole suspension performed very well. Just my tires weren’t able to keep up with it and I got stuck two times in fairly easy (you would say) terrain. It starts just after this mud puddle. Normally there would be no problem in going up, but my tires got filled up with mud in the puddle and they became very slick. The results? The car went not the way I wanted it to, but slipped with it’s rear tires right into ruts pulling whole car towards the tree. Although it doesn’t look that bad there were moments I was closer than inch from this tree. So after 3 tries I decided to back up and try another route. Then there was muddy trail in which I just couldn’t move anymore – I got high centered – all wheels were spinning with no move at all. Conclusions? I desperately need to buy new tires.